For continued updates on Ever Oasis, be sure drop by our Game Hub. It will bring together all of the various articles, screens, and videos that we’ve posted onto one page. 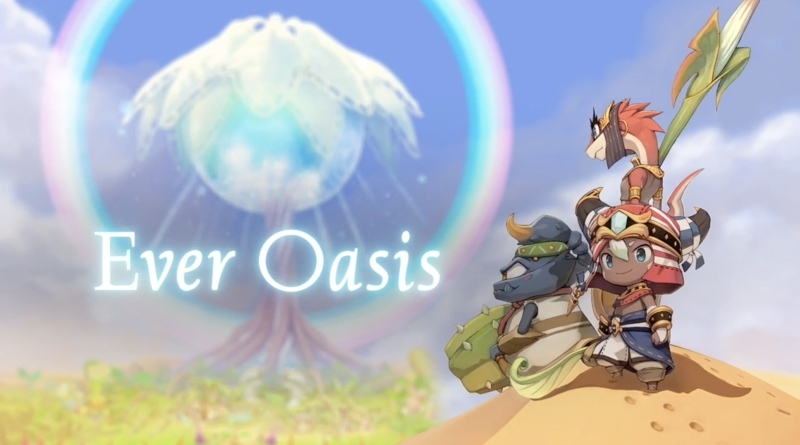 Ever since Ever Oasis was shown off at last year’s E3, we’ve been excited to see more. The game sort of went into hibernation and now it’s almost ready to be released. This new Action/RPG looks to be something rather special, with great artwork and interesting characters. Nintendo of Japan posted an overview trailer and although it’s completely in Japanese it gives some great insight into what to expect when the game launches in North America on June 23, 2017. 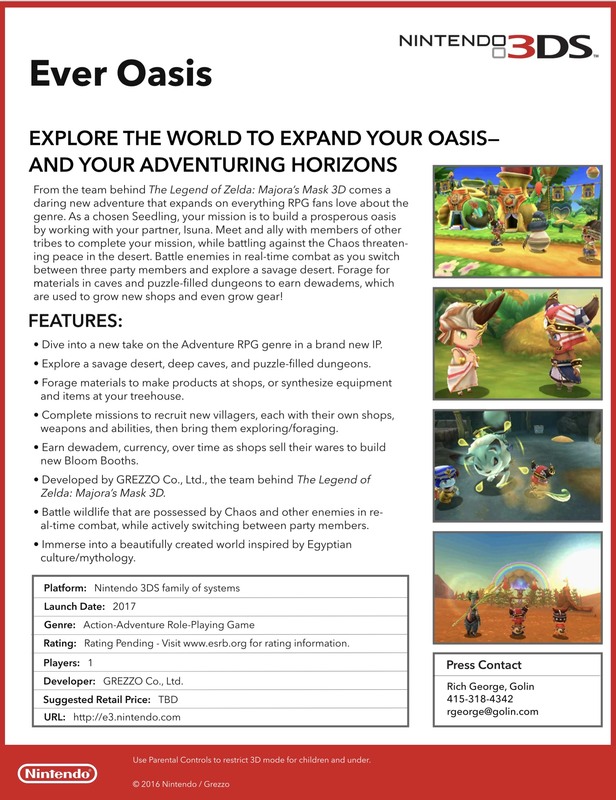 Grezzo has a new game for the 3DS that Nintendo will be bringing out. Isuna creates an oasis and a place for you to live. You can welcome new visitors from far off tribes to your town. Venture into the desert to forage, battle, and discover. Team up with wanderers to explore the dungeons. You have the ability to switch between allies on the fly. This new IP is being developed by Koichi Ishii. He worked on Final Fantasy 1, 2, 3, and 11. He created the Job Class system in the Final Fantasy franchise. He also worked on all of the Secret of Mana games and has been in charge of the recent 3DS Zelda remakes. The Treehouse team played a demo of Ever Oasis. The main character’s name is Tethu, a small boy. You will be able to play as a female as well. You can build your town, including shops. Instead of buying your equipment, you have to stock up the shops with the inventory. As they sell your items, you get rewarded. Isuna will give advice and level up your character. The game focuses on building up your oasis by expanding your town and shops. Each of your characters has unique abilities, such as wind, that can help fight as well as obtain items. You can switch between your party members on the fly and control any one of them. There are three characters at any one time in your fighting party. Miura and Roto are the other two characters in the demo. They each have their own weapons and special powers. To solve puzzles you will need to switch between them throughout the adventure. As you come to areas a bubble will appear over your character to tell you to switch to a different one. The dungeons are very detailed and have a ton of Zelda-like puzzles. In fact, I’m surprised at how much there seems to do in the dungeons. The game also has a lock-on ability to target enemies so you and your NPC teammates can all focus attacks on a single monster. Many enemies don’t just go down with one hit, and some of them are almost like mini-bosses. The entire game has an Egyptian-inspired graphic style, including the localization of the names of enemies and places. The visuals have a unique flair to them and look great on the 3DS. Even the music has chanting and a very Egyptian sound to it. In fact, I came away very impressed with music. It’s epic and a lot of work has been put into it. Everything is super smooth and looks fantastic. It’s refreshing to see such a fresh take on a new game. There are many types of different weapons. Ranged and melee, but also ones with magical abilities. When fighting a boss it’s important to switch between characters to use each one’s abilities. While locked on, you can roll and dodge attacks. The boss, Baastu, looked quite challenging in the live stream. The game does have a day/night cycle. This impacts the game in several ways, with different stuff going on in the oasis depending on the time of day. Out in the desert more difficult enemies will appear during the evening.